In 1982, I was paid to read aloud. What a fantastic gig for a college student: Money! For READING! For a couple of hours per day, I went into a small room with a book and tape recorder, pressed REC, and went to town. I voiced history, biology, forestry, psychology, nursing, sociology… it's impossible to recall all the subjects that went through my eyes and onto cassettes. The Disabled Students Services (DSS) office at Humboldt State University (HSU) was a fantastic place to work as a student, and when I was later offered additional opportunities to take notes in classes and drive the accessibility van around campus, it was clear I was in the right place. I was helping others and getting paid—how cool was that? Compared to what we use today, computing was primitive in the early 80s. When I started college at HSU in 1981, there were a couple of rooms of dumb terminals that connected to a mainframe computer elsewhere on campus. At the time it was nearly state of the art, but it was far from convenient and very few students used the system. Interfaces were driven entirely by text input— considered a big improvement over the punch cards still found as scratch paper in the terminal rooms. These systems fascinated me and before I ever enrolled in a computer course, I borrowed my roommate's account to explore what was available. Even though it was not my major, I completed a couple of programming classes. And when my family purchased a personal computer to help run their auto repair business, I spent a summer teaching myself to program a database for the CP/M operating system. I also acquired a Commodore 64 personal computer to learn coding in the BASIC language. It was early in the 80s when standalone (personal) computers appeared in homes and small businesses. At first it wasn't clear how they'd be relevant to college students. The Commodore 64 was one of the first non-campus computers used to produce papers for schoolwork. With its awkwardly slow cassette tape storage, I used it only occasionally; I probably typed the majority of my papers on a typewriter. I did learn to touch type on that old C64 though, so it definitely was valuable, and longer papers were much easier to edit with a word processor instead of repetitive typewriter sessions. But what about assistive technology (AT)? At the time, computer accommodations were fairly simple. Commercially available solutions comprised a very short list, and to assist most users, the technology was not difficult to select—if it existed. There just weren't many options then. ProVox was the screen-reading technology for DOS (a popular operating system before Windows) commonly used in these early days. Cursor movement through documents and displays was predictable as there were no graphics. 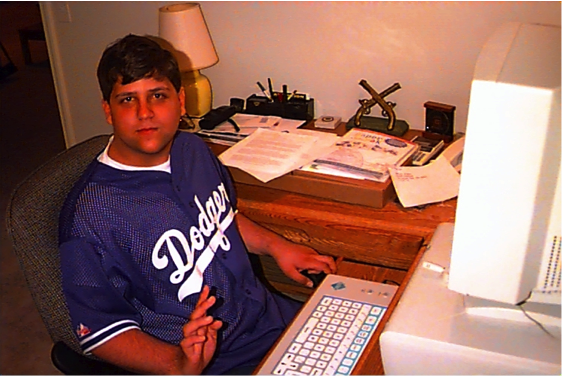 Blind people could independently use word processing applications, participate in bulletin board systems (dialup forums for discussion and file sharing), and have pretty much the same access to computing as a sighted person due to the text-driven interface. One of the people I got to know through my job at Humboldt was a fellow computer nut (as we were known) named Robert. He attended a nearby community college and would stop by my office to chat about computers and our projects. He had cerebral palsy and used a TRS-80 computer. I visited him at his home where he loved to show off the programs he laboriously coded, typing slowly on a keyboard using a custom key guard that his uncle made to help him from hitting the wrong keys. Robert’s primary transportation was a wheelchair and his speech was very difficult to understand, but he could accomplish amazing feats with a single (and simple) piece of equipment added to his computer. This is when I first grasped the importance of making computing accessible for everyone. Some AT that was in place in the 80s provided functionality that is still familiar today. 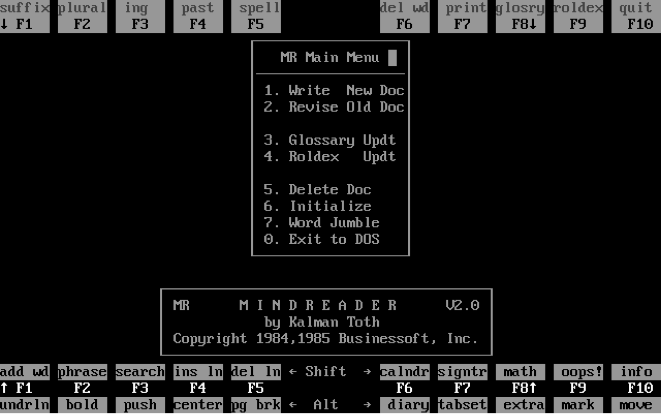 For example, there was a word prediction program called MindReader that did double duty as a word processor. Slow typists or students with learning disabilities could benefit from it. But sound required add-in hardware and was never used except in a few games, so visual cues weren't needed for individuals who were deaf or hard of hearing. However, switch input for more severe physical disabilities was not available as a turnkey option and required custom switches and interfaces. Magnification was accomplished with a lens attached to the monitor. Video displays were not sophisticated enough to allow software to magnify the screen. Once video cards became a bit more agile, small terminate and stay resident (TSR) programs that provided very basic magnifications began to appear. It was crude stuff though, as the pixels that made up characters in normal view became blocky and distracting once enlarged. There was no need for alternatives to the mouse, because a mouse was considered a household pest, not an essential computer part. Early DOS programs did not support mouse input—it was purely keyboard control in that environment. A mouse was something you could get with Apple computers and we’d heard about AT programs for the Apple world, but few of them seemed relevant to college students. I know now that wasn't strictly true, but at the time many of us considered Apple computers a learning tool for youngsters in the K-12 system and not for serious work. Accessibility with some of the Apple models was fairly simple with an add-in card that allowed switch-based input, and a built-in synthesizer appeared with the Apple IIe model. In 1984, the Apple Macintosh appeared with its iconic television ad during the Super Bowl. It was amazing, powerful, and easy to use. It was also fundamentally inaccessible for blind users until a third party screen-reading program called OutSpoken was released in 1989. For many, Outspoken was difficult to use and learn, and the majority of blind users stayed in the world of DOS. Around this time Apple included in the Mac OS a simple magnification utility called CloseView. Later, Berkeley Systems, the creators of OutSpoken, released a much better option for magnifying the Macintosh OS called InLARGE. Macintosh accessibility improved, with vendors creating powerful word prediction, switch input, and educational software for this platform. After my college graduation, I remained on campus for an opportunity to parlay my student job into a part time position as Assistant Coordinator of Humboldt’s DSS. With experience working in and managing most of their services, I created a database to track note-taking, transportation, and reading requests. We acquired just a few pieces of AT to have in the office for students to use. PC labs were just beginning to appear on campus in 1986, and we had a single DOS-based computer that was used for the service database as well as demonstrations and training for the limited assistive technology available. Then one of the cyclical state budget crises hit California, eliminating my position and leading me to seek other opportunities. I hit the road, parlaying my database and general IT skills into a variety of gigs until I could find a way back into the AT band. After moving north, I found a couple of jobs that allowed me to use some of my coding and database skills, but I was missing the human component that had been so satisfying at Humboldt. When the position for an adaptive computer specialist appeared at the University of Washington (UW), I leapt for it. Not only was it an opportunity to worm my way back into the intersection of people and technology, it was also an exciting opportunity to help start up the nationwide Disabilities, Opportunities, Internetworking, and Technology (DO-IT) Scholars program. This National Science Foundation (NSF)-funded program (which continues today with funding from the State of Washington and other sources) recruited high school students with a variety of disabilities and provided them with computers, assistive technology, and access to the emerging and exciting resource known as the Internet. My role provided technical support and training to the staff and students. I visited the participants in their homes, set up new computers and whatever technology they needed for access, and taught them how to get online, use email, access Gopher (a predecessor to the World Wide Web), as well as any tips and tricks for their AT. Access to the Internet in the early 90s was far from simple. There were online services such as CompuServe and AOL, but they were not the same thing as the Internet. Online worlds back then were separated. Nearly anyone who used the Internet at this time was affiliated with a university, the military, or government. In order to get access to the Internet, these high school DO-IT Scholars needed an account at a nearby college or university, and it was uncommon to provide such access to someone unaffiliated with the institution. I was often able to beg a dialup account for our participants with their nearby campus IT department, and if that institution was reluctant, I could grease the skids by offering a modem for the school's dial-up facility in exchange for the student’s local login. Once our DO-IT student was online with their local college, they could connect to their account at the UW and get access to their email and other resources. DO-IT purchased and used our own Unix server that was maintained by central IT at the UW. It was named “hawking” after the astrophysicist Stephen Hawking, who met with DO-IT Scholars and staff for the first time in 1993 during a lecture tour. The hawking.washington.edu accounts were used throughout the early years of DO-IT, and some students fully embraced the Unix world and went on to pursue their own IT-related interests and careers. Before the Internet, the best way to learn how to use a computer efficiently was to read magazines or engage with a user group. User groups were typically local computer clubs, and there are still a few in operation today, though most people prefer to use online resources instead of meeting in person. If you wanted to be in the computing game, you needed access to magazines such as PC World or PC Computing. Apple and Macintosh aficionados had similar periodicals. To attach something to your computer, even something as simple as a mouse, you couldn't just plug it in and expect it to work. You needed to know about interrupts (IRQs), communication (COM) ports, and the Basic Input/Output System (BIOS). These acronyms were a mystery to many. If you supported more than one computer, you’d have to remember how each device was attached to each computer or spend time puzzling over the configuration. Some of us kept a slip of paper inside the computer case that recorded these settings. This note also let someone coming along later have a clue as to the machine’s configuration. If you were fortunate, a device used a parallel connection and was easier to work with. But if you wanted to use more than one peripheral? Tough it out, bucko, as there were only a couple of ports provided on each computer. To attach more devices, you'd need to order and install add-in port cards, and it was back to the BIOS in order to get them working properly. Fortunately, the emergence of the Universal Serial Bus (USB) has simplified the peripheral attachment process tremendously. I doubt anyone misses the days of IRQ and COM mysteries. In 1995, the Adap2U was a unique piece of hardware, made in the Seattle area by AdapTek. It was incredibly powerful and offered a number of options for people with severe physical disabilities to operate any Windows or DOS computer. It utilized a complex system of macros and scripts as well as a second monitor that controlled its layered interface. It was a flexible, agile, and capable system using a customized interface for switch or pointing device users. Inability to use a keyboard or mouse was no barrier to complete access to a computer. To get it working, it also required a significant amount of knowledge of the operating system as well as basic principles of coding. Far from an out-of-the-box access solution, this product and its company dropped off the AT map in the late 90s because many teachers, parents, and AT specialists could not get the training needed to set up and support this device. There are still versions of this adapter used today, and their owners fiercely guard and stockpile them. In my current office, I continue to use an original Apap2U monitor stand to hold my laptops. I mention the quirky Adap2U to highlight the fact that those of us who have been in this field for very long well understand that there is much more to providing AT support than learning about disabilities and specific assistive technology products and solutions. It’s still necessary to have a solid foundation of general IT knowledge to be able to install, troubleshoot and maintain much of this non-standard hardware and software. The stuff of AT is only one part of the solution—it’s still necessary to have staff versed in the details of operating system, common workplace applications, and networking. Assistive technology training or courses that don’t address general IT skills provide an incomplete skill set. After the launch of the Windows 3.1 operating system in 1992 there was an accessibility chasm for blind computer users. This popular graphical interface was radically different from the character-driven DOS experience, and the first efforts to provide screen-reading accessibility in an environment driven by icons and a mouse were decidedly rough. By the emergence of Windows 95 there was a handful of screen readers providing fairly complete access to the operating system and common applications. Although we only hear of two of these today (JAWS and WindowEyes), a few of us old-timers also recall Windows Bridge, ProTalk for Windows, Outspoken for Windows, and Winvision. The "Dueling Windows" sessions at the California State University, Northridge (CSUN) conference were crowded with cheering people as up to 10 different Windows screen reader developers or users attempted to perform a series of assigned tasks with their product. With the increasing popularity of the World Wide Web, accessible design of online content became a leading issue in the accessibility field. Netscape Navigator, the first popular graphical web browser, was very forgiving of poorly formatted HyperText Markup Language (HTML), allowing a flood of people to become web "publishers" with little training or knowledge of well-structured content. Just when screen-reading technology seemed to have a handle on access to the Windows OS, it was again left behind with the accessibility problems related to web-based content. In 1997, the World Wide Web Consortium, or W3C, launched the Web Accessibility Initiative (WAI), an effort to creating standards for accessibility in content, browsers, and authoring tools. In those heady days many of us believed that if only we developed and published these standards, the rest of the world would take notice and begin fixing accessibility. Over 15 years later, it’s clear this belief was irrationally optimistic. The attraction of online publishing is that it's easy to do. It's also easy to do it inaccessibly. However, the WAI ignited a spark for accessibility and continues to be the primary chorus supporting our efforts to improve online accessibility for all. So here I am 30 years after recording books on tape, continuing the AT journey, still learning new operating systems, applications, and accessible technology. We are seeing the integration of accessibility features in everyday devices such as mobile phones and tablet computers. Operating systems are usable with included or open source applications. With a few exceptions, accessible technology is relatively inexpensive, easy to install, and available on multiple platforms. By no means do I present myself as someone with an encyclopedic grasp of accessibility. For example, when I first saw the iPhone shortly after its launch in 2007, I was given one to try over an extended time. “This will never be accessible,” I remember saying to those who would listen. Boy, was I wrong! Just a few release cycles later in 2009, Apple included features and made this pocket computer and communication device a primary accessibility tool for many, not just for those who are blind, but also for other people with print disabilities, limited vision, or speech challenges. I was pleased to be proven wrong, and look forward to other technology vendors making similar strides in integrating accessibility. One of the many benefits of working in the AT field is that it’s rarely boring. As technologies change, operating systems evolve, and new platforms such as smart phones and tablets emerge, there remains a need to investigate, deploy, and support accessible solutions for people with disabilities. And the people drawn to this field are some of the most fun, interesting, and capable folks I’ll ever meet. Keeping our knowledge up to date continues to be a work in progress. Although our knowledge delivery mechanisms have primarily shifted from print publications and email lists to blogs, forums, and websites, there’s a continual need for face-to-face interaction to improve our knowledge and skills. Networking is not only defined by electronic communications, it's meeting our peers in person. On today’s enormous technology stage, the people of assistive technology make up an extremely small part—a band of experts that demonstrate their focus, commitment, and knowledge and help end users and developers contribute to the same album, if not always the same tune. It's easy to focus only on technology; it's exciting, always changing, often frustrating, and when it's done properly, truly liberating. But the absolute number one reason this field has kept me on this long strange trip is always the people. The tech is intriguing, even distracting, but it’s the people who design and use the hardware and software that give it meaning and make it sing. To those who have traveled along with us, let’s keep the music going. And to those who are new, welcome to the band, grab on, and chime in. Comden, D. (2014). A Lifetime of Tech—What A Long Strange Trip It's Been. Information Technology and Disabilities E-Journal, 14(1).